The biggest mistake pimple sufferers make is over-washing their skin. Let’s not forget that acne is caused by what happens inside our hair follicles, not by having dirt and bacteria on our skin. You should only wash your face twice per day with a gentle soap or cleanser. If you have oily skin, use Ivory soap. If you have dry skin, you can use Dove soap. 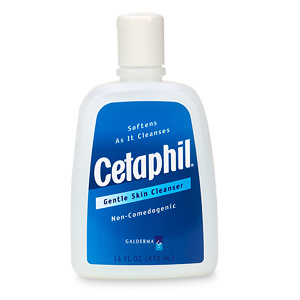 If you have sensitive skin, use Cetaphil. In fact, I would recommend Cetaphil to any acne sufferer. Apply the soap (wet it with lukewarm water) to your face with your fingertips and gently apply it in a circular motion. Don’t rub or use any type of cloth or pad which can irritate your skin. Rinse the soap off completely using lukewarm water and then pat dry your face with a soft cotton towel. Again, never rub with a towel as you are trying to avoid aggravating your skin. That’s it! If you need to care for dry acne prone skin, it is even more important to use a gentle cleanser like Cetaphil instead of regular soap. You will want to apply a non-comedogenic moisturizer to your face when it is still damp after you wash it. Be careful using topical products that contain alcohol and products containing benzoyl peroxide as these will make your dry skin even worse. I don’t subscribe to the “dry your pimples” school of thought. In my experience, dry flaky skin is uncomfortable and makes acne look even worse. Again, your acne plan should include only twice a day face washing even if your skin is oily. You might try some gentle astringent cleansers such as Noxema Triple-Clean Astringent but don’t overdo it. Only use it on the parts of your face that are oily and no more than is necessary. Astringents irritate the skin so you might find, again, that they do more harm than good. You might find that your face produces even more oil if you use an astringent so using them can be counter-productive. The good thing is, with oily skin you should save a few dollars on moisturizers! What are the next steps in my acne plan? Now you know how to wash your skin properly and that is a huge part of your acne plan. The next thing you need to do is decide which treatment options you would like to consider. It all depends on the severity of your acne. Acne Plan: Mild Acne If you only have the occassional breakout and you suffer mostly from blackheads and whiteheads as opposed to deep, painful pimples, you should consider trying 2.5% benzoyl peroxide gel in combination with a salicylic acid cream. You don’t need stronger than 2.5% as clinical studies have shown this concentration is effective and not as harsh as stronger formulations. The salicylic acid creams help the benzoyl peroxide get deeper into your pores. This one-two punch works for many mild acne sufferers. Don’t fall for the marketing hype, my friend. There are a ton of skin care products for acne prone skin that claim to control acne. Don’t buy it. Most of them are useless but a good way to lighten your pocket book if that’s what you’re looking to do! Acne Plan don’t: Special Acne Soaps: Some even contain benzoyl peroxide but the fact is that these soaps might irritate and aggravate your acne instead of helping. They are washed off so quickly (because you are following the How To Wash Your Face section above, that even if they had some magic ingredient, they aren’t in contact with your skin long enough to do anything. Save your money. Acne Plan don’t: Pore Cleansing Strips: These have been around for decades and it makes you feel good all over when you peel one off your nose and it’s covered in little spikes of black goo from your blackheads. Unfortunately, strips irritate the skin and don’t really do much good. Acne Plan don’t: Exfoliants: these come in many forms and the idea is to scrub off dead skin cells and grime. If you have acne, you must avoid anything that will irritate your skin. That goes double for loofahs! Exfoliants won’t help you and will do more harm than good. Avoid like the plague. Acne Plan don’t: Masks: unless you are using a specific mask as part of a holistic treatment, avoid masks just like you would avoid exfoliants. Most masks sold to acne sufferers contain salicylic acid, benzoyl peroxide, or even lemon juice and they will inflame your acne instead of reducing the symptoms. Acne Plan don’t: Antibiotics: Sure doctors have traditionally prescribed both topical and oral antibiotics to attempt to treat acne but I don’t suggest they become part of your acne plan. First, they don’t go after the root cause of acne: androgen hormones. They merely target the P.acnes bacteria which makes acne worse but doesn’t cause it. While eliminating the bacteria can lesson some of the symptoms, there are some undesirable consequences including depleting the “good” bacteria in your system, creating drug resistant bacteria, and upsetting your stomach for little gain. My advice is to steer clear of antibiotic treatments.